We've had the final version of v6 of Mobile Data (the product previously known as Pocket PC Creations) from our Australian partners. - a new name - Mobile Data is much better than Pocket PC Creations! - much better layout on the new higher resolution screens. This product will enhance Tracker Mobile, Toy Tracker Mobile and our other mobile data capture applications. I've personally used an electronic diary, contact book, note-taker etc since the days of the Psion organiser (Series 3) in 1991. In fact, I can't actually remember using a paper diary now and an electronic companion has been my way of life ever since I first got hooked. Personal Digital Assistants (PDAs) were all the rage in the 90s but come the new millennium there was a feeling that the day of the PDA was over and only techies would be interested in using an electronic device in this way. Then the smartphone was born - initially as a Windows device and the market got very excited that one device could be your phone, diary, to-list, address book and even camera. This market grew but then stagnated and many of the manufacturers with early devices dropped out of the market. Again, the feeling was that the products had reached the end of the line and the geek market was saturated. Then, out of the blue, the iPhone and the Blackberry came along and all of a sudden the smartphone was cool (iPhone) or business-cool (Blackberry). Windows Mobile took a back seat but the number of smart all-in-one devices sky-rocketed. I've been reminded of all this when glancing around the conference room I've been sitting in all morning. Virtually everyone around me has a smartphone in front of them and it is completely taken for granted - between talks, everyone is emailing, sending texts, checking the web for sports results, updating their diary... we have become reliant on the smartphone for so much of our daily routines. Google are starting to launch their own-branded phones and Microsoft are soon to release the innovate Windows 7. This technology is clearly here to stay and if the next decade moves us as far as the last one, who knows what we'll have in our pockets come 2020. In our 10th year of trading (3 complete years as a separate Ltd company focussing just on software development), we have just posted our best-ever set of financial results. Turnover was flat compared to the previous year, which in the recession isn't bad, but pleasingly profit was up 14% on the previous year. With a healthy order book and a major new software development project about to start, 2010/11 is looking bright for us here at Start. We are nearing the end of a county-wide installation of Toy Tracker at Cornwall Council. We are converting existing data from several other (inferior!!) 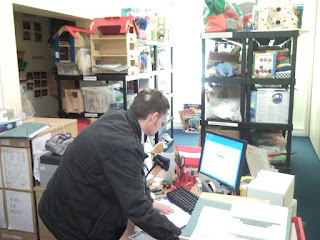 toy library systems and retraining users as we roll out the software. Covering 16+ toy libraries across the whole of Cornwall, this is our largest roll-out of Toy Tracker yet and so far so good - all of our joint preparation with the Cornwall IS team is paying dividends. The users are looking forward to Toy Tracker's legendary ease of use and barcoding facilities, as the IS team will reap the benefit of a single county-wide SQL database.